Image courtesy of Tourism and Events Queensland. The Great Barrier Reef stretches more than 2300 kilometres along Queensland’s coastline and is made up of around 3000 individual coral reefs. It is of special significance to Aboriginal and Torres Strait people with a number of cultural sites on many of its islands. It also supports around 69,000 jobs and contributes approximately $5.7 billion to the Australian and Queensland economies. The World Heritage Committee meets each year to consider the state of conservation of world heritage properties. In July 2015, the committee met and unanimously agreed not to place the Great Barrier Reef on the world heritage ‘in danger’ list. 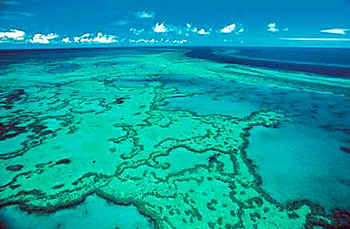 The decision recognised the significant work by the Australian and Queensland governments, in partnerships with scientists, Traditional Owners, community and industry to further protect and manage the Great Barrier Reef with the development of the Reef 2050 Long-Term Sustainability Plan (Reef 2050 Plan). In December 2016, Australia provided UNESCO’s World Heritage Centre with an update on the progress with actions under the Reef 2050 Plan. The Great Barrier Reef’s World Heritage Area lies within one of the best managed marine parks in the world, the Great Barrier Reef Marine Park. The Great Barrier Reef Marine Park Authority manages the park with support from Queensland Parks and Wildlife Service marine park rangers through a joint field management program and through laws and zoning plans. The field management program includes monitoring patrols, compliance work, maintenance of camping grounds and moorings, monitoring of nesting and breeding sites and pest and fire control on the reef’s national park islands. Tourism, fishing, recreation, traditional use, research, defence, shipping and ports are all carefully managed through zoning plans that define what activities can occur in what locations to minimise environmental impact and conserve the majestic marine environment. In the catchments adjacent to the reef, the Queensland Government works with farmers, industry and other groups to ensure everyone plays their part in improving the quality of water flowing to the reef through the Queensland Reef Water Quality Program. Reef health (coral, seagrass and marine life) has been declining due to poor water quality and the cumulative impacts of climate change, including warmer weather leading to coral bleaching and increased severe weather events, such as cyclones. In the summer of 2015-16, the Great Barrier Reef experienced its worst mass coral bleaching event on record. Bleaching occurs when corals are stressed, in this case from overheating. Excess nutrients, fine sediments and pesticides from agricultural run-off and other industries pose the biggest risk to reef water quality. Sediment smothers corals and reduces the amount of light reaching seagrasses and other plants, affecting their growth and survival as well as the survival of the marine animals that depend on them for food and shelter. Excess nutrients may be linked to outbreaks of the coral eating crown-of-thorns starfish. You could read more about the science and the reef’s complexities in the 2017 Scientific Consensus Statement – Land Use Impacts on the Great Barrier Reef Water Quality and Ecosystem Condition.